On October 23rd, the Town will expand its recycling efforts to include the collection of cardboard. Continuing efforts to save residents money, this initiative is the result of the Town’s transition from dual stream to single stream recycling – an effort estimated to generate $2 million for taxpayers over the next five years. Since the beginning of local recycling efforts more than a decade ago, initiatives have COST taxpayers money rather than generate funds for the Town budget. For instance, recycling cost taxpayers $91,465 in 2016. That will no longer be the case! Under this new single-stream recycling initiative, the Town will generate approximately $434,760 in revenue annually for taxpayers. How is this possible? The private sector will reuse recycled items and we will share in the profits. Additionally, the Town will now utilize its garbage trucks (on recycling days) and sell 22 recycling trucks no longer needed – generating up to $1 million in additional revenue for taxpayers. This initiative demonstrates our commitment to exploring every avenue to save taxpayers money and this revenue will help the Town freeze property taxes in 2018! Single-stream recycling means you place all of your recyclables into one recycling container. It’s easy…simply put all of your newspapers, cardboard, plastic containers, glass bottles and jars, metal cans, and junk mail into one container. Cardboard collection is new to this process and there is no need to separate it or bundle it from other recyclables. Simply breakdown the box and place it in your recycling container or alongside it. You can use the container previously provided to you or purchase your own and obtain a sticker from us to identify the can/container as a recycling bin. With your help, we expect to achieve record levels of recycling. To do that, we need residents to do their part. Please rinse all food and beverage containers and place only recyclables in your recycling container. By recycling, you are doing your part to protect and preserve the quality of the environment. You are also keeping taxes down because every ton of material we recycle is one less ton of waste that we need to pay to dispose of. 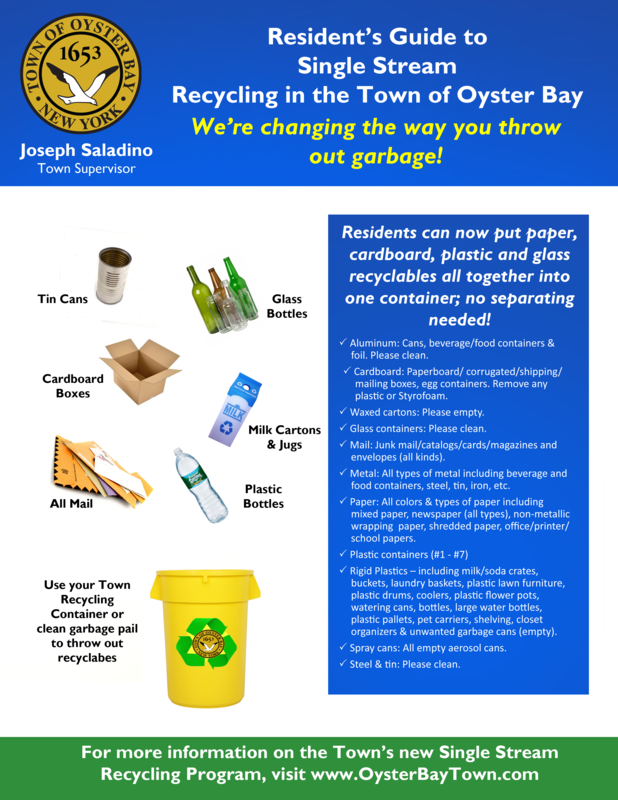 Single stream makes recycling easy and I thank you for your support of this new initiative and keeping Oyster Bay clean and beautiful. For more information about single stream recycling or to obtain a sticker to place on a container, please call (516) 677-5745.